Furnace is a minor super-criminal, who first appeared in 2004. He exists in Skybound’s super-hero comics universe, but he’s a simple character who could pop up anywhere without raising an eyebrow. Marital Status: Unrevealed (presumably single). Base Of Operations: Mobile throughout the United States. Height: 5’10” (unarmored), 7’2” (armored). Weight: 170 lbs (unarmored), 1600 lbs (armored). Furnace possesses the normal human strength one would expect to find in a man of his age, height and build who engages in regular exercise. His suit of armor augments his strength to superhuman levels, allowing him to lift (press) weights up to 1 ton directly overhead. Furnace’s body is composed of a substance resembling magma. It is constantly radiating both heat and light. On average the surface temperature of his body is 400°C (750°F) but with concentration he can increase this temperature to much higher levels. Whether he can project heat or flame from his body (like Magmaniac does) is unrevealed. He has never been witnessed doing so without the use of his armor (see Weapons section below). Furnace possesses a high degree of raw intelligence. He also has an aptitude for engineering. 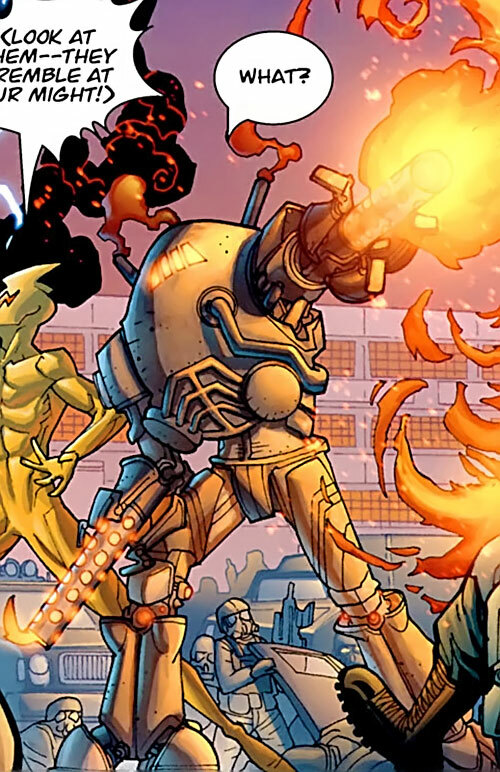 Furnace utilizes an advanced suit of armor while executing his criminal endeavours. It is quite durable and has an extremely high melting point. The twin cannons in the armor’s arms focus Furnace’s energy into precise blasts of pure flame. The exhaust ports in the legs likewise allow Furnace to fly. The armor can also concentrate and focus Furnace’s energy through exhaust ports in its legs. The expelled energy acts like a jet stream and generates enough thrust to allow the armor to achieve self-sustained flight. Furnace seems to be unable to regain his normal human form. This has some advantages – presumably, he doesn’t need to eat or breathe. But being a living walking mass of magma limits the interactions one can have with other people in day to day life. Furnace is a relative small time mercenary who continues to fall upon hard times. In the past, he has utilized his talents as a part of a larger group. Beventually made enough money to branch out independently. This lasted for a short time before he encountered the young Viltrumite hero, Invincible. Furnace was in the middle of a job when Invincible intervened. The fight between the two was laughably short, and Invincible reduced Furnace’s armor into scrap metal. Furnace eventually escaped police custody. He rebuilt his armor at the cost of all of his savings. With no assets left to his name, Furnace was forced to return to the mercenary life in order to eek out a living. With his fate once again in the hands of others, Furnace developed a deep hatred for the young hero Invincible. He swore that he would gain his vengeance. An occasion arose when he saw Invincible and the villainous Titan attacking his boss, Machine Head. 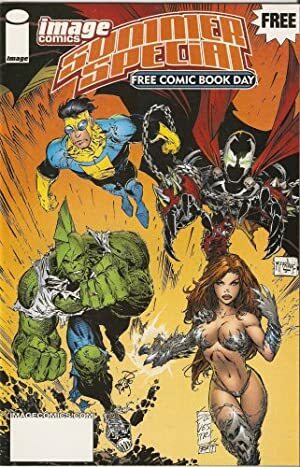 Unfortunately for Furnace, Invincible proved once again to be too powerful for the heat-based villain, and his suit of armor was destroyed once more. Furnace has escaped police custody on at least one other occasion since those events and remains at large today. Furnace looks like a humanoid column of magma. His form is clearly fluid in nature, and glows with an internal light all of its own. As he moves his body pulses while globules of glowing plasma flake of his body. The Furnace armor is a massive and bulky construction. It is a start and dark grey, with several chimney like protuberances jutting out of its back, and a grill like plate that is set directly in the faceplate of the armor. While the body of the armor is massive, it arms and legs are thin and spindly. Each of the arms end in three claw-like fingertips that can be withdrawn to extend long single barrelled cannon like protuberances. The cannons have exhaust holes that run up and down the barrels. Furnace is an intelligent and ambitious criminal who has a burning desire for both personal and financial freedom. He is willing to go to great lengths to achieve this result, and is not averse to murdering innocents to achieve it. 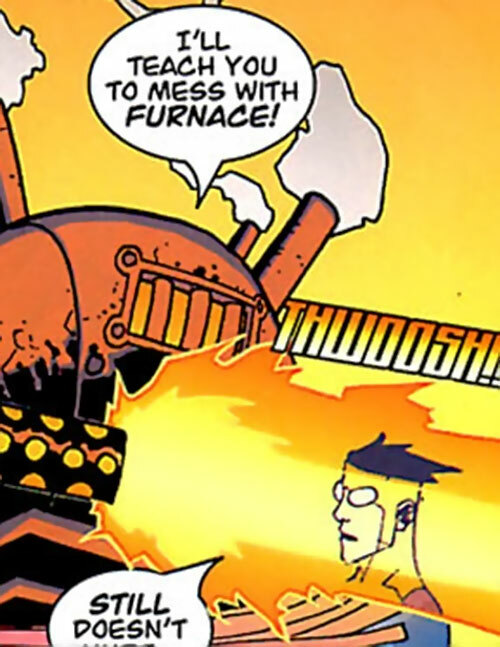 Furnace is clearly sociopathic, and holds deep and lasting grudges. All Powers are Contingent Upon Flame Being (-1FC each). Flame Being is Always On (-1FC). Flash provides steady illumination only (-1FC) and is Always On (-1FC). Fluid Form has the bonuses Does Not Loose APs of STR in Fluid Form (+2FC) and is Always On (-1FC). 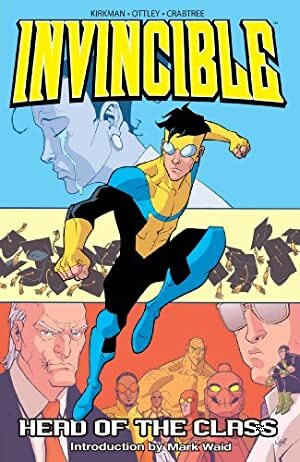 MIH (Invincible), Public Identity, Strange Appearance. 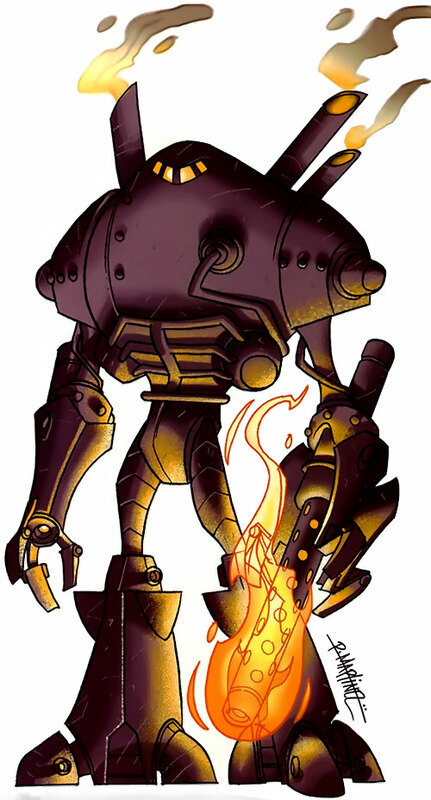 FURNACE ARMOR [/BODY/ 10 /STR/ 07, Flame Blast: 09, Flame Immunity: 04, Flight: 06, R#02. Bonuses & Limitations: Miscellaneous (Armor requires pilot to have the “Flame Being” Power in order to provide it power)]. Writeup completed on the 8th of August, 2013.